We now know that indoor air quality is widely associated with significant negative health impacts. As awareness of this connection increases, technology companies are developing state-of-the-art tools for consumers and HVAC specialists that make it easier to assess home or office air quality. Imagine a filter so effective that it is able to remove toxic gases in NASA’s next-generation spacesuit life support systems. That technology, created by the company Serionix, is also being developed for consumer HVAC products and, as such, will be available perhaps as soon as the end of 2017. 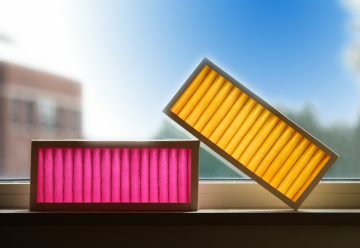 The filter works through a proprietary adsorptive coating technology called ColorfilTM, which changes colors as it removes toxic chemicals and odors from air, while killing viruses, bacteria, and mold. “Through an intuitive, vibrant color change, ColorfilTM lets users know when the filters are working—and when they aren’t. This allows consumers to actually see when it is time to replace their HVAC filter,” he adds. Did you know that humans now make more dust than any other natural process on earth? This fact has prompted the development of technology for particle sensing, which is the act of detecting dust in the air, and characterizing that dust and its potential health effects on those who may breathe it. A new particle sensor, called the HPM series, is in the works at Honeywell. It is designed to help building owners and consumers monitor the air for potentially harmful particulate contaminants caused by dust, soot and smoke. “Particle sensors play a critical role in measuring and managing the quality of the air we breathe to help protect our health,” said Graham Robinson, president of Honeywell’s Sensing and Internet of Things business. “Our sensor outputs an electrical signal that can be fed into HVAC control systems in buildings and homes or into other air monitoring devices to measure air quality in homes, buildings and public spaces,” he explains. The HPM series uses laser technology to accurately and cost-effectively monitor for fine inhalable particles that are 2.5 micrometers in diameter or smaller. For reference, the average human hair is nearly 30 times larger at 70 micrometers in diameter. According to the U.S. Environmental Protection Agency, fine particles, which are often caused by burning fossil fuels, can settle deep into lungs or even enter the bloodstream and pose health risks.